You have to hand it to the people at Blue Door Arts. They’ve brought life and creativity into Cheyenne’s derelict Hynds Building, a structure with a complicated past. Unlike some other downtown buildings, there is no in-house ghost at the Hynds. But it holds a graveyard of abandoned renovation plans. Art center? Community college dorm? Office building? Condo/retail complex with a view of Depot Square? All have been considered. One of the plans floated was a home for ArtSpace, a live/work facility for area artists that might have included a gallery space on the main floor. While at the Wyoming Arts Council, I was privy to some of the meetings with the Minneapolis-based non-profit arts developer that led to studies and more meetings but eventually met a dead end. So, artists being artists, Terry Kreuzer and Georgia Rowswell took over the space and hung their art. They found plenty of wall space plus an array of big picture windows on a busy downtown corner that serve to lure the curious inside. Blue Door Arts is now part of the monthly Cheyenne Art Walk and is open for regular hours on Fridays and Saturdays from 1-5 p.m. There is life in the old place. 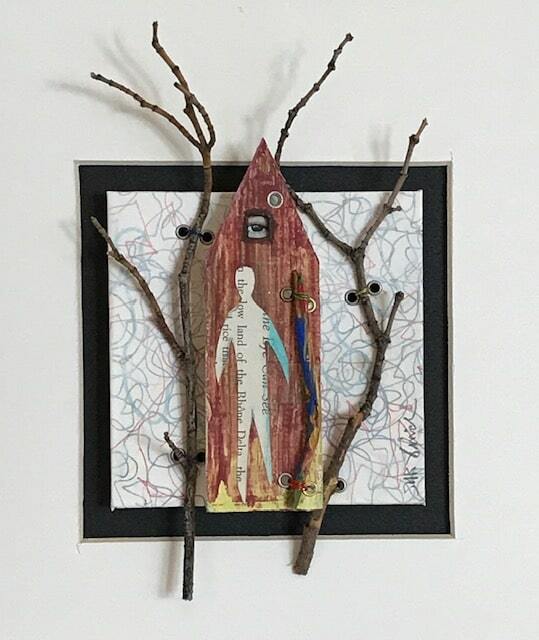 The Hynds is home to a collection of artists that, in addition to Kreuzer and Rowswell, includes Mike McIntosh, Kevin Robinette, Greg Fladager, and Mitch Guthrie. They all once occupied the space together. Kreuzer and Rowswell split a year ago with “the guys” when the duo decided they wanted to host monthly arts shows while the other artists wanted to stick with their own art. Kreuzer and Rowswell occupy the middle space in the building while the others occupy the space that fronts on Lincolnway (16th Street). On the north side is Three Crows Gallery and Gifts. The whole enterprise comes under the purview of LightsOn! Cheyenne, a nonprofit established specifically to turn the lights back on at the Hynds. Since the launch of LightsOn! with a Wyoming Cultural Trust Fund grant in 2010, the Hynds has hosted art shows, a Friday night concert series, dance recitals, and the Governor’s Capitol Art Exhibition. 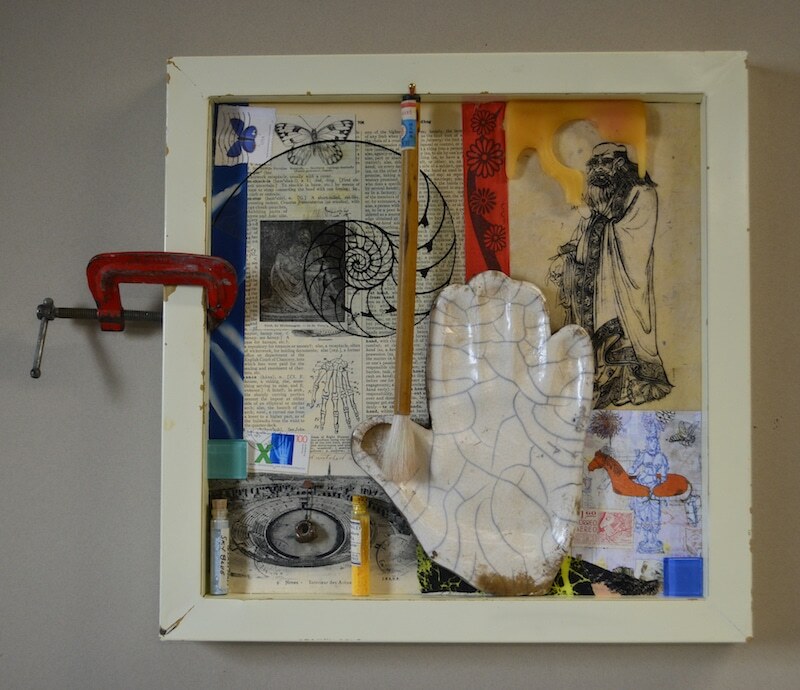 The latest Blue Door exhibit is The Art of Assemblage. It features work by Kreuzer and Mark Vinich of Cheyenne and Becky Hawley from Loveland, Colorado. A blizzard postponed its original opening reception from March 14 to March 21. It continues through May 5. 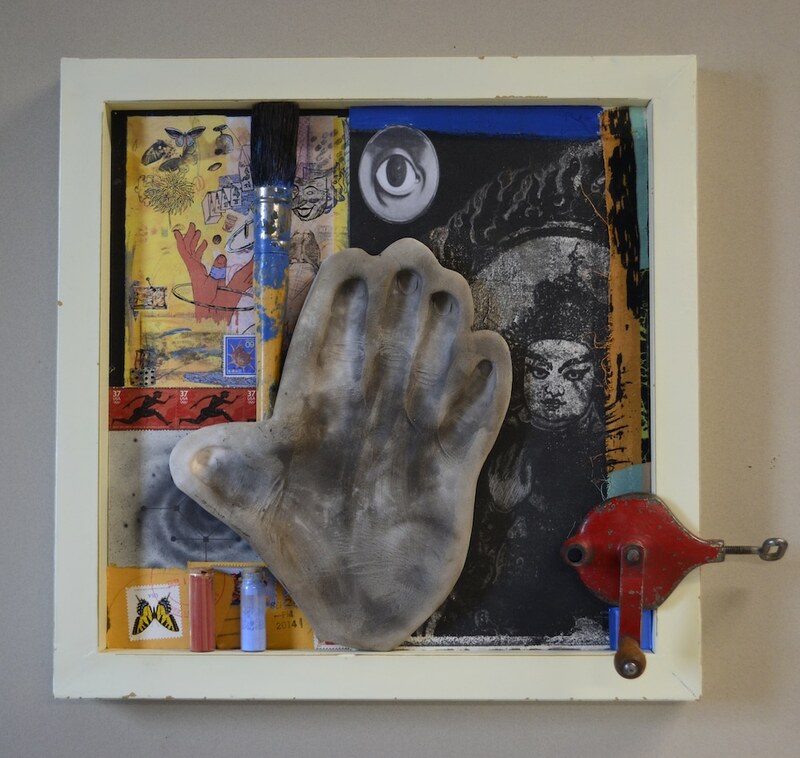 The artwork are all assemblages, 3-D works made with a variety of found objects, keepsakes and curiosities. This exhibit is a salute to imagination. Each piece is marked with handwritten labels. This observer could have used more info on each piece: dimensions, materials, etc. Artists’ statements would also be helpful. That said, I realize that this space is run by two very busy artists in pursuit of their own visions. There is no curator on staff. In fact, there is no staff. An art teacher at Davis Elementary School and partner at Clay Paper Scissors Gallery & Studio, Vinich’s facility with a variety of art forms shows to advantage in the assemblage form. Three of his pieces are exhibited together in what Vinich refers to as “The Neighborhood Series.” Vinich grew up in Lander among several generations of his family. In “Whispering Secrets,” he explores a childhood fear that there was a big spooky eye staring at him through his grandmother’s attic window. A ghostly figure appears in the space below the mysterious window and I thought for a moment that it might be the ghost that the Hynds Building sorely lacks. But when asked, Vinich admitted that the figure represents his childhood. The paper figure occupies a plain wooden house flanked by bare trees made from budding tree branches. 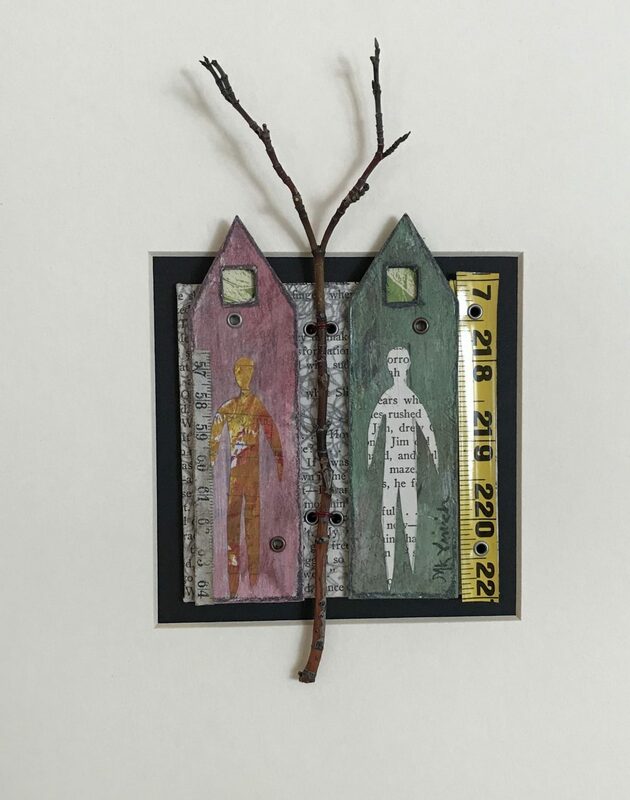 Vinich playfully adds metal-backed black glass buds to the otherwise bare branches that represent the trees that once surrounded grandma’s house. The artist adds a stick, partially painted blue and featuring glass buds, to the assemblage. This memory seems more poignant when Vinich recounted that grandma’s old house was sold and demolished, leaving both Vinich and the ghostly eye without a family homestead. A similar piece, “Farmer in the Dell,” remembers an elderly couple who occupied an old house and a pink barn in the neighborhood. The couple entertained local kids, making the pink barn a lively place. It now exists only in an artist’s work. Hawley’s work at Blue Door Arts reflects this intent. In “This is Fun,” Hawley has constructed a piece that harkens back to the non-electronic games of our youth. An old Bingo card provides the background to a well-used Foosball player and a piece of the handle from the game with a die attached. A lone chess piece sits at the bottom of the assemblage next to the words F-U-N. The weathered wood frame says that this is a blast from the past. The piece took this viewer back to old Bingo halls and beat-up Foosball tables in friends’ basements. That Hawley spells out F-U-N hints that not all viewers of the work will know the use of these objects. It’s as if she’s leaving a calling card for future generations: this is how we had fun back in the olden days. Hawley came up early to the March 21 opening to check out Cheyenne antique stores. She prowls the Front Range for cast-off artifacts. One day, she spotted an old gaming table leaning up against a store’s dumpster. Intrigued, she stopped to find a beat-up, many-decades-old Foosball table. She knew that the parts would come in handy in assemblages. She asked the store owner if she could take it away and, years later, one of the ancient wooden Foosball players stares out at art appreciators of 2019. Kreuzer’s work has always been eclectic. You can see some of her public artworks around Cheyenne. As you attend the many summer arts festivals around the state, you’ll likely see Kreuzer and her arts booth, as she spends at least three weekends each summer at area art shows. She offers jewelry, pottery, masks, and mixed media pieces. Some of her larger assemblages, such as “Syncopated Hemispheres,” never make it on her road trips. They do, however, look great showcased on some of the spacious walls at the Hynds. Her roots in the artisan world go deep. Her family ran Kreuzer Sheet Metal out of a shop on 15th Street, just down from the Depot Museum. It’s where Kreuzer got her start with taking things apart and putting them back together in intriguing ways. She also grew familiar with a variety of materials that would show up later in her artwork. And then there’s the old hot water bottle on her “Broken Brain” piece. The Styrofoam head that is the focus of the piece is surrounded by found objects such as a glove, paintbrush, children’s blocks, a wooden meat tenderizer and old photos. Red thread wraps the head and game pieces orbit it like moons. On the right bottom of the piece sits an upside-down hot water bottle. Kreuzer said she was fascinated by the rubber appliance labeled “Iris” and embossed with stylized figures. She finally found a place for the object, although she can’t say why. Earlier, as she spoke about workshops she conducts, she said that you can overthink a piece. Sometimes, it’s better to let your broken brain run free. Kreuzer is involved in the Cheyenne community as an advocate, workshop leader and iconoclast. She is not sure how much longer she will operate the Blue Door Arts space, as she is busy now with making pieces for the summer and then will be on the road. Her goal for the space always was to stake a claim in her home town’s downtown. She thought that the Hynds might be an ideal site for a city arts center. After occupying the space for almost a year, she now realizes its shortcomings. She has her eye on the old power plant at 17th Avenue and Snyder. The art center idea may take a couple million dollars to achieve. Funding is available through grants and private investors. Lots of work. But on the plus side, the plant sits right in the midst of the West Edge Project and just a short walk from the Depot Plaza, downtown restaurants and the new park/performance space adjacent to city hall. So who knows? The following workshops will be offered as the Wyoming Arts Project which, along with ongoing exhibits at Blue Door Arts, are funded by LightsOn! and the Wyoming Cultural Trust Fund. Each workshop is held at Blue Door Arts, 1608 Capitol Ave. Fee is $30. For all workshops, pre-register at tkreuzer@terrykreuzer.com or call/text Kreuzer at 307-214-3932. Kitchen sink Intaglio (Intro to Etching), April 27, 10 a.m.-5 p.m. Materials provided. Limit seven people. Instructor: Greg Fladager. Future Planned workshops. Check back for more information or pre-register as above. Is there more info on the journal/sketchbook workshop May 4? Is on making the journal or filling it? Hello Susan, workshop will be on making the actual journal/book itself with Camellia El-Antably who majored in book-making. She makes lovely paper objects and has participated in an international Book Arts exhibit @ Laramie County Library. Co-partner in Clay Paper Scissors gallery & Studio with Mark Vinich in Cheyenne. She holds a MA in Book Arts from Camberwell College of Arts in London and a BA from Mills College in Oakland, California. Susan: Call or text Terry Kreuzer at 307-214-3932.